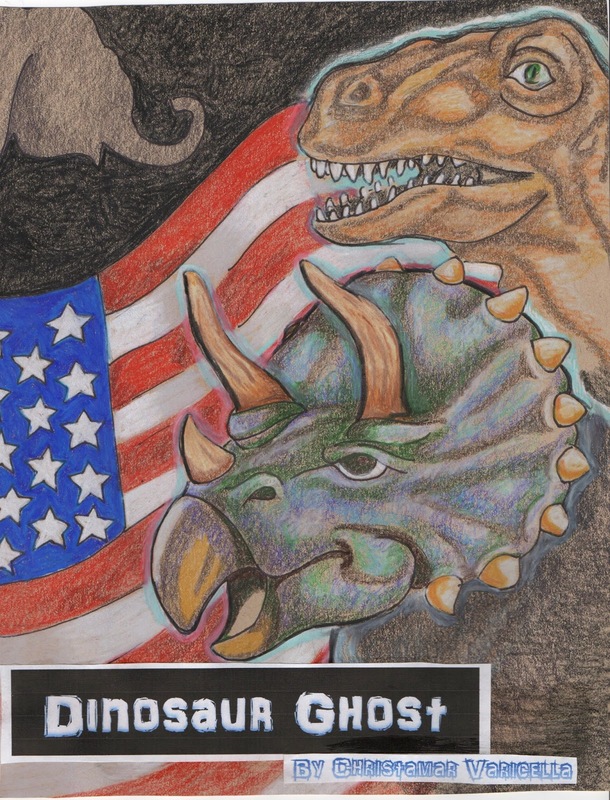 The following chapter is excerpted from the satirical novella "Dinosaur Ghost" which answers the age-old question, "What would happen if dinosaurs came back from extinction and started eating republicans?" The updated novella will soon appear as a stand-alone eBook as well as in the print edition of the humor collection "There Are Sneetches in My Breeches." Donald J. Trump removed a solid gold driver from his golf bag and proceeded to shank his solid gold Titleist into a nearby lake. "That's a hole in one," he said to his caddy. "Score that as a hole in one." "Whatever you say, Mr. Trump," said former New Jersey Governor Chris Christie. "But are you sure you want to continue using the gold clubs instead of the titanium ones?" He held up the driver that was now twisted like a pretzel. "They're getting all bent up." "Why shouldn't I keep using solid gold clubs?" Trump asked. "Everyone knows gold is the best kind of metal. Besides, I've made nine straight holes in one." "Of course, Mr. Trump. How could I have been so stupid?" "Because you are stupid," Trump said. "Now punish yourself." "Punish yourself for your mistake." Chris Chrisie sighed and then proceeded to take off his shirt. Whenever he made a mistake, Trump liked for him to strip down to his underwear and shimmy about while singing 'I'm a little teapot," while Trump shouted, "Dance, Tubby! Dance like you mean it!" and threw nickels at him. But for some reason, Donald's heart wasn't in it today. He felt a sudden wave of melancholy. But why? He should have been happy. Earlier that morning he had succeeded in using government regulations to put an elderly couple out of their home. Now he could bulldoze their property and none of the members of his golf course would have to look at their ugly house. Perhaps it had something to with the fact that three of his companies had gone into bankruptcy that week, putting a damper on his latest press release which stated only that he was "The greatest businessman in the history of business." Could it have had something to do with the media backlash surrounding his retweeting of racist messages and images originating from the Ku Klux Klan? No. All publicity was good publicity. "What is it then?" he asked, but Chris Christie could not answer because he had fallen into a sand trap. Trump shook his head. He knew the answer to his rhetorical question. It was those damned dragons from the news. It didn't bother him that they were eating all the other republicans. The problem was that they were taking attention away from him. Some journalists were even speculating that he wasn't conservative enough to be eaten by dinosaur ghosts. Maybe, they said, he was getting a pass because he never bothered to figure out what conservatives were supposed to believe according to the party manual. "But how could I read the party manual?" he asked no one in particular. "That thing was like twelve pages long." An aide standing nearby looked around, but there was no one else to whom Mr. Trump could be talking. "Absolutely, Mr. Trump. Twelve pages is much too long for anyone to read," he said. "A little help," said Chris Christie from the sand trap. "Screw those dragons," Trump said. "I'm conservative. I'm the most conservative person who ever lived." A low growl emanated from the direction of the sand trap. Trump looked over and saw the shimmering image of a Tyrannosaurus rex chewing up the remains of Chris Christie. "Hey, who said you could eat my caddy?" The dinosaur just looked at him, then looked over his shoulder at a stegosaurus who was happily munching from the rough. "Hey who let that lizard eat my gold course. Was it you?" He shot a look toward his aide. "No sir, Mr. Trump. I think it was Governor Christie. Shall I call security?" "Yeah, I can't have these ugly things on my beautiful golf course. I want 'em out of here!" While the aide called security on his walkie talkie, the tyrannosaurus roared to the stegosaur. The roar roughly translated to, "Should I even bother to eat this guy? He's doing far more damage to the republican party than we ever could." The stegosaurus shrugged its shoulders. The tyrannosaurus stared at the Donald with a mix of curiosity and revulsion. "You know, you really are a stupid-looking dragon," Trump said. "I've never seen a dragon that looked so stupid. Puff the Magic Dragon is scarier than you." The aide step forward and whispered into his ear. "Sir, that's actually a dinosaur. Dinosaurs are different from dragons." "I don't think that's right," Trump said. "Dragons are green and scaly and they breathe fire." He pointed at the dinosaur. "That's definitely a dragon." "I don't think it breathes fire," the aide whispered. "What kind of dragon doesn't breathe fire?" Trump walked around the side of the dinosaur before offering a dismissive appraisal. "Pathetic. I should have you deported. I should build a wall around you so no one has to see how ugly you are." "Hey," said the dinosaur in a hurt-sounding way. At least, it kind of sounded like hey. Trump looked up at the dinosaur, who stood three stories tall. "You aren't so big," Trump said. "I'm just as big as you." He backed up against the dinosaur. "Let me ask you something," he said to the aide. "Who's taller? Me? Or this dragon?" He put his hand on his head like a measuring stick and then lifted it up to the dinosaur's knee. "Um..." said the aide. "It's pretty close. I think maybe you're taller, Mr. Trump." The tyrannosaurus looked at the aide and made a noise which roughly translated to, "What are you talking about? I'm clearly much taller than this jackhole." "I knew it," Trump said. "I'm as big as a dragon." At this point the tyrannosaurus had had enough. He proceeded to eat Donald Trump just to get him to shut up. He was a hard person to swallow, and the dinosaur was tempted to spit him out, but a gulp of lake water helped wash down the putrid taste. If the republican party could swallow him, then so could he. Later, he and the stegosaurus took turns wearing Trump's orange wig while doing impressions of him. They laughed deep into the night. If you enjoyed this excerpt, please share it with others via social media. 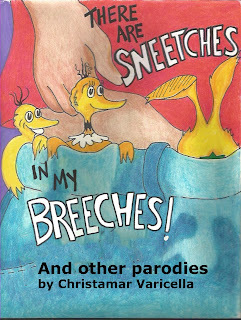 The eBook version of "There Are Sneetches in My Breeches" is available for preorder at Amazon.com. Information about the print edition of "Sneetches" is coming soon. The original draft of Dinosaur Ghost is available as a free down load at smashwords.com. Cover art by Christiana Helgeson.